A question template defines single-answer questions in a format that you can process in bulk. 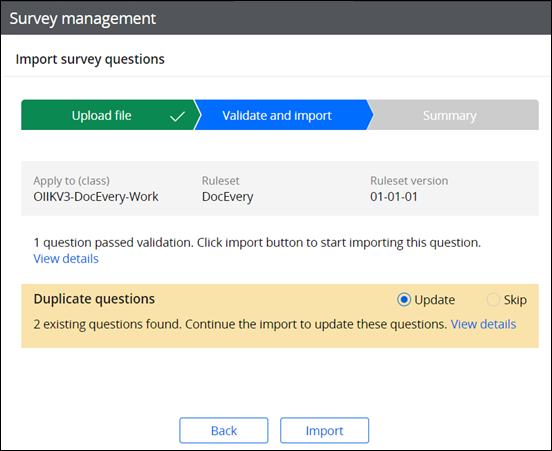 By importing raw data instead of manually creating questions, you can speed up the development of your surveys. For example, you can quickly configure the possible answers to a question, such as a scale of one to ten, by using a comma-separated list in your template. The following table provides some examples of the types of questions that you can define in a question template. Are you the primary member? Because question templates store data in a flat format, you can filter, sort, or copy and paste relevant values to ensure that your survey has a consistent look and feel. When you reimport a template, you can choose whether existing questions are updated or ignored. You can get more information about which questions were created, updated, or ignored, by reviewing the import summary. The following figures illustrate the actions that you can take during each step of the import. 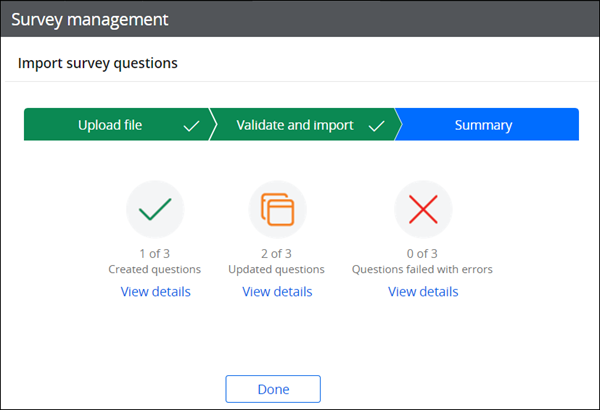 For multi-answer questions or advanced functionality, such as scoring answers, use the Survey Management landing page to configure your questions.